“There's always something going on along the route, both in the forest and on the shoreline itself. Stormwatching along this trail is unrivalled in season. The trail is easy walking - a few climbs, but nothing too strenuous, and there are plenty of benches with great viewpoints along the way. The trail has recently been extended, and the new sections are just as worthwhile as the previous stretches. 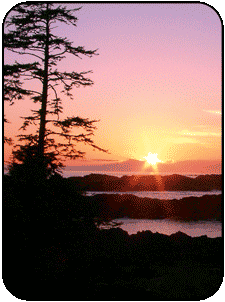 This trail will be a major factor in keeping us coming back to Uclulet for years to come!" Please leave no trace of your visit on the trail, especially if your dog wishes to leave a donation! The trail is open year round during daylight hours. Weather is mild in any season. Since the rainforest canopy provides shelter, there is no need to delay your walk if it is a rainy day. 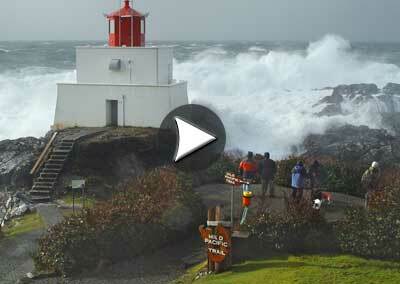 Fall and winter storms are a memorable experience, attracting storm watchers when the waves are towering. In the event of extreme winds, the trail will be closed. Most areas of the trail are accessible to children’s strollers, and paved wheelchair access is available at the lighthouse, and beyond if you have an off-road model. The main parking area is off Coast Guard Road near the lighthouse. A smaller lot is available at Brown's Beach. Please leave bikes in racks provided at parking lots. Portable toilets are provided at Lighthouse Loop Whale Parking Lot, He-Tin-Kis Otter Parking Lot, Brown's Beach Sea Star Parking Lot, and at Tugwell Field Raven Lot. Pit toilets are available at the lighthouse and Big Beach Park. There is NO running water. New regulations in Canada prohibit the flying of drones withing 9 kms of an aerodrome. The WIld Pacific Trail is located next to a heli-pad near the lighthouse and the harbour is an aerodrome for float planes that fly along the coast. The fine for breaking these rules is up to $3,000. Please stay on the trail and enjoy our convenient oceanfront benches to watch for abundant marine life from seals and sea lions to whales. You may even spot a sea otter – newly returned to the coast after near extinction. No one has ever been hurt while hiking this trail but you may encounter wolves, bears, or cougars anywhere on the west coast. Dogs running off leash have been hurt by wolves so please protect your pets with a leash. No dog on a leash has ever come to harm on this trail. Click here to read more about how to avoid wildlife conflict. Side trails into the forest or onto rocks are often wildlife paths and should not be followed. The forest has many layers of trees growing on fallen logs so solid ground is actually a maze of cavities that will collapse underfoot. Off-trail use will also damage forest plants, help us keep the Wild Pacific Trail wild. This trail network is divided into three main sections. Click to a button to learn more about each section. This section is a 30 to 45 minute loop - 2.6 kms with an easy grade along the coast, and hills inland. Allow extra time to enjoy views from frequent benches. If you wish to see the new BOG Interpretive Loop, turn left at the map sign, if you wish to see the lighthouse first turn right at the sign. Grade is moderate to challenging as you climb small hills and stairs. Begin at either Big Beach Children’s Interpretive Trail or Brown’s Beach parking lot. The entire route is along great coastal views after a short inland section near Brown's Beach. Grade is easy until a short hilly section on the bluffs. Help us keep the WILD in the Wild Pacific Trail. Leave no marks on benches, trees or rocks--if you witness a vandal please call bylaw enforcement at 250-726-7744. Call 911 in emergencies. Report errors to Schramm Design — Website is copyrighted, no images can be used without written permission. Site updated 2018.